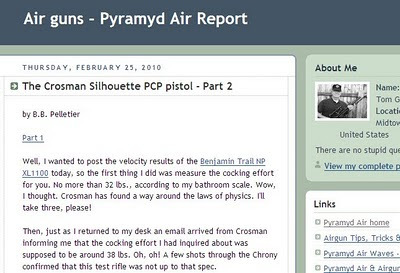 Speaking of fine blogs, in case there are UK readers of Rabbit Stew who have not had the pleasure of finding the Pyramyd Air Report I'd like to recommend it. It's a huge and ever-growing encyclopaedia of immensely detailed and careful investigation into all things air-gun and its factual and utilitarian approach makes it a great research tool. I'd suggest using the search facility there to open its treasures as its - by internet standards - vast five-year post archive can be rather daunting to swallow whole. I subscribe to B.B. 's blog and it's a wealth of information. A second thumbs-up from across the pond. I was a guest Blogger for Tom two years ago. Great blog! The Pyramyd blog has such a quiet and undemonstrative appearance that it's easy to see it, go 'OK, yes, it's another airgun blog' and then move on. But that's to miss a goldmine, really, because as well as the extraordinary attention to detail in the posts there the number of responses to each post mean that for every topic touched upon you get to read dozens of well-informed additional comments. Read one post and the replies there and you'll get a view across the question at issue from virtually all the points from which it can be seen - all of them knowledgeable, polite and enthusiastic. The post that went out today, for instance, already has 88 comments! Eighty-eight! Great blog and good information. Read one post and the replies there and you'll get a view across the question at issue from virtually all the points. You can find many interesting information at Tom's place. Enjoy.